I have received many requests for help with this project since I first wrote it over a year ago. So I decided to take another look at it. As it said at the beginning of the original article, the main input came from a posting by dozencrows, in the RaspberryPi Forums. He has in fact done further work on the original article, and a much better implementation can be downloaded from this post here. The actual download link for the modified motion file and associated config file is here. I have tried this out today on the very latest raspbian distro. As in the original article you should install motion and libjpeg62. Then download dozencrows modified motion and config file. For safety I suggest renaming HIS version of the motion file motion-mmal and using the set up and run command from my original article. That way you don’t run the installed motion binary by mistake. I tried this with his config file as downloaded, but you can of course modify it to meet your own requirements. Set up the camera as per the picture in the original article, and you can then record using that program. I hope that this update will make it easier for readers to get this going. This project is based on a post by dozencrows here which explored the use of a Raspberry Pi camera board as a motion detecting video cam. It is based on the motion package in Debian. He has recompiled this with a slightly different configuration, making it convenient to work with the Raspberry Pi cam board. I take no credit for the code, but hope that details of how I have se it up on my system, and how I have connected it to a Synology NAS with built in Surveillance Station will be of interest to others. The original thread has multiple posts on it, and it can be confusing to get to grips with the code as a result. For convenience I have ssh enabled on my card so that I can carry out the work on it via a link to a terminal on my main computer. First make sure (if you haven’t already) that your raspian is up to date. you can search for a string by typing ctrl+w and inserting the string you wish to find. When you have finished amending the file use ctrl+o to write out the amended file, selecting the existing filename to overwrite by pressing return. Then select ctrl+x to exit the editor. The start stop process is hardly ideal, so I have written a couple of scripts to start and stop the process. The command used in the start motion script was suggested by adayforgotten in the original topic thread. As you have seen, if you type the ./motion-mmal command to start the camera directly you cannot type subsequent commands into the terminal, and if you type ctrl+c or exit the terminal then the process terminates. Wrapping the command in nohup……& makes it run in the background and be independent of the terminal closing, which would normally stop dependent processes The >/dev/null redirects the standard output to /dev/null, throwing it away. The “2>&1” part redirects the “standard error” output of the command to the standard output. the “</dev/null” unattaches the console keyboard and uses “</dev/null” instead. Thus the script can start the process without producing any screen output. 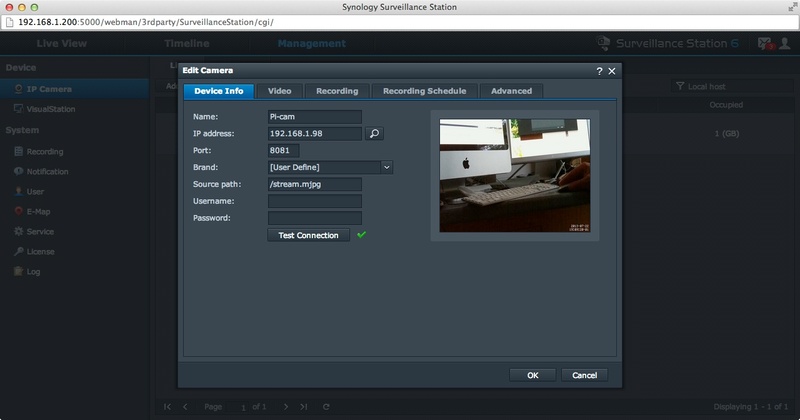 If you have such a NAS you can log in to it with a web browser and start the supplied surveillance station. The trick is in how to setup the camera configuration. Although the frame rate is rather slow, the system works and in the time line of the Surveillance program you can inspect video where there has been motion detected. The surveillance program has a full help file. I have a question about this. When i start the cam it initially captures a motion, no matter if there was one or not. I think it’s because there’s no picture to compare with. But i have no idea how to change that. Do you have the same issue? When I run “./motion-mmal -n -c motion-mmalcam.conf” it looks for specific versions of the libraries. The latest debian repositories have moved up the versions of libavutil, libavcodec and libavformat. I tried creating softlinks but it now complains about “version `LIBAVUTIL_51′ not found (required by ./motion-mmal)”. Can I fix this without having to recompile his version of motion? I don’t think you can use this with different libraries. I didn;t compile the original motion-mmalcam.conf file, but you should be able to recompile yourself for more up to date libraries. You could try the original author of the file https://www.raspberrypi.org/forums/viewtopic.php?f=43&t=44966 Alternatively you could look t the motioneye project https://github.com/ccrisan/motioneye/wiki/Install-On-Raspbian I have used this and it works very well. That’s very helpful, thanks! I decided to follow your advice about motioneye. I went with motioneyeOS. It was very easy to install and works like a charm. This article is now quite old, and I suspect that some of the libraries may have moved on to newer versions whereas the version of motion used here was fixed from a download from a different site as you will see in the article. May I suggest you could look at the motioneye project instead https://github.com/ccrisan/motioneye/wiki/Install-On-Raspbian I have used this and it works very well. That is very odd, and I don’t see at all why this should be. As regards the article it is now quite old, and I suspect that some of the libraries may have moved on to newer versions whereas the version of motion used here was fixed from a download from a different site as you will see in the article. May I suggest you could look at the motioneye project instead https://github.com/ccrisan/motioneye/wiki/Install-On-Raspbian I have used this and it works very well. That’s fine James. I only suggested motion eye as an alternative. I’m afraid my version is so old now that it is not viable to maintain further. MotionEye is just a(nother) web frontend, which already has a web frontend itself. I merely suggested Motion Eye as an alternative, because as I have pointed out this article is very old now, and some of the code on which it is based has not been updated, so it is no longer maintained or in working order.